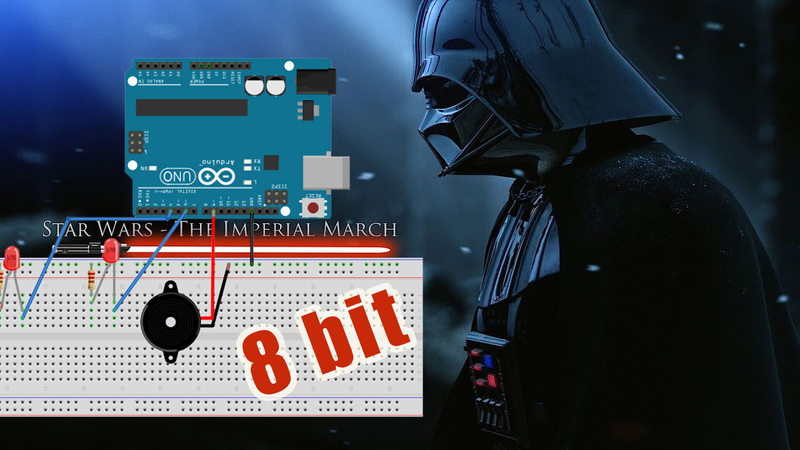 In this project we will learn to build a circuit, in which we can reproduce using a small speaker or buzzer plus a scale of musical notes, that reproduce the famous melody of the "Imperial March", and to improve our presentation more we will incorporate some LEDs that will flash to the beat of the music, from the movie Star War. To achieve a scale of musical notes through a buzzer / speaker. As we can see, we do not need much to get this tutorial, so let's start. The main image is quite descriptive but we will clarify the basic connections. We will make a connection to the leg on the left of the buzzer that will link to the GND PIN of our Arduino UNO. For the leg on the right, we will make a connection with the PIN 9 of our controller. // Above shows the equivalences between frequencies and Natural scale notes, they are not all declared but they exist. // We generate a loop that runs through our vector. This will be responsible for entering a certain frequency to the buzzer each time, as we have declared the tone vector. // Above shows the equivalences between frequencies and Natural scale notes, they are not all declared but they exist. I use a frequency of -10 to generate a barely audible sound that replaces the silence that should sound in the melody. I invite you to share a better solution to avoid the buzzer sounding in that position.